Sad news: I just heard on the tube that Lou Reed passed away - age 71. I recall finding his Transformer long-player in the racks at Caldors. Rumor was that Lou posed in drag for the photo on the back of the LP. It turned out that the rumor was false, but at the time, I did not know the truth and I stood in Caldors staring at the back of the LP for a long time taking in Lou's excellent femulation. So long, Lou. I will miss you. 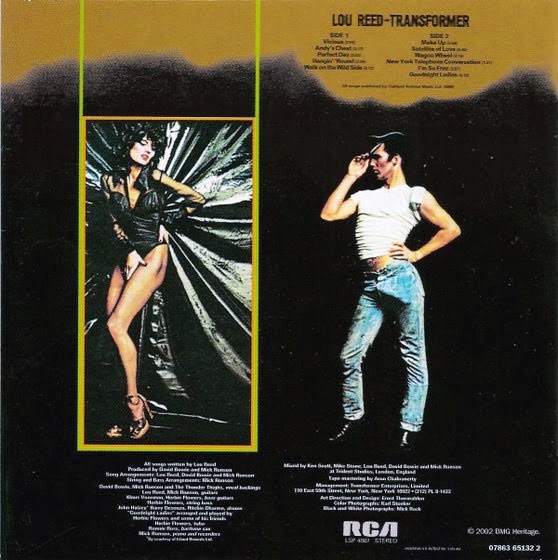 I had heard the same rumor about Lou Reed in drag on the Transformer album cover. I miss album covers. Few knew him, many loved his work. RIP Lou, you will be missed. Lou Reed was special. His Walk on the Wild Side served both as a motto by which to live a full life and an acknowledgement that there were special people in society that were entitled to be treated with respect and dignity.